This episode of Shop Talk Live is sponsored by Audible. Head over to Audible.com/ShopTalkLive to get a free audio book. I have a 400/1000 grit combination diamond stone, a high quality honing guide, and a leather strop. People always talk about removing the burr on the back of the blade after sharpening. I try to do that, but it seems to just bend back around and doesn't come off. I end up with a tiny sliver of iron on the end of my blade which is not straight and that I can bend with my finger. Why is this happening, what am I doing wrong? 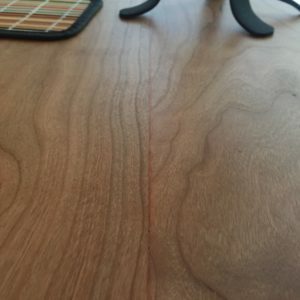 Is there a maximum board width you are comfortable gluing up for a table top? I've heard that wider boards that are ripped down somewhat are more stable in the long run. I'm using some hickory for my top, and the boards will be around 10" wide following stock prep. I'd prefer not to rip them down. I recently made my first shooting board and modeled it after Mike’s shooting board with the sliding speed square for miters. My fence is dead square, checked with multiple hardware store squares but my cuts have yet to yield a square result. The consistent result is a cut that is high on the fence side of the board. After squaring and re-squaring many times I am at a loss. What am I doing wrong? A few months ago, I made a small side table out of cherry for my wife. The table came out great but I’ve noticed in the past weeks that the glue line has turned into an obnoxious orange color. 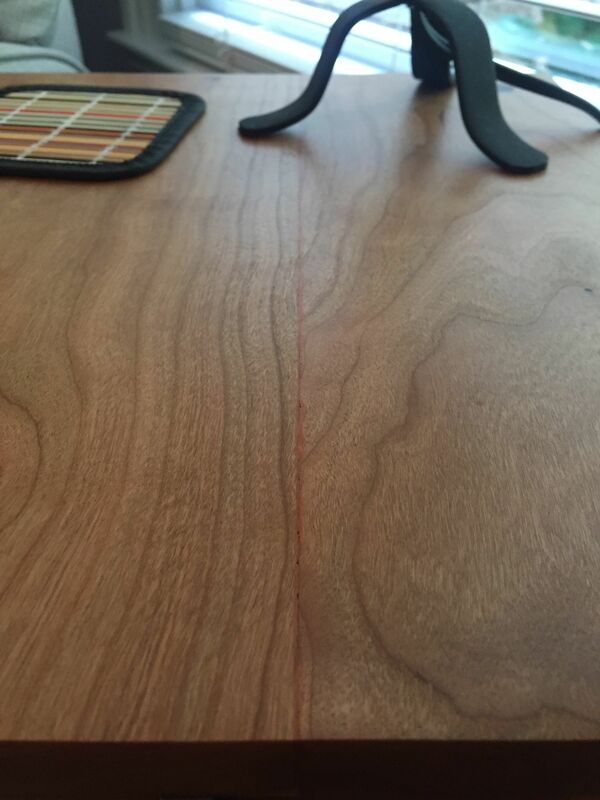 The table has sat in indirect sunlight since finished. 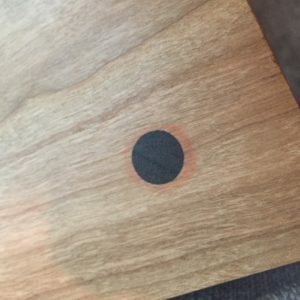 The dowels have a “starburst” effect of glue around them and the glue line between the boards in the panel are now clearly visible. I was wondering if you’d ever experienced this. I had thought I’d sanded enough to remove any residual glue but perhaps not. 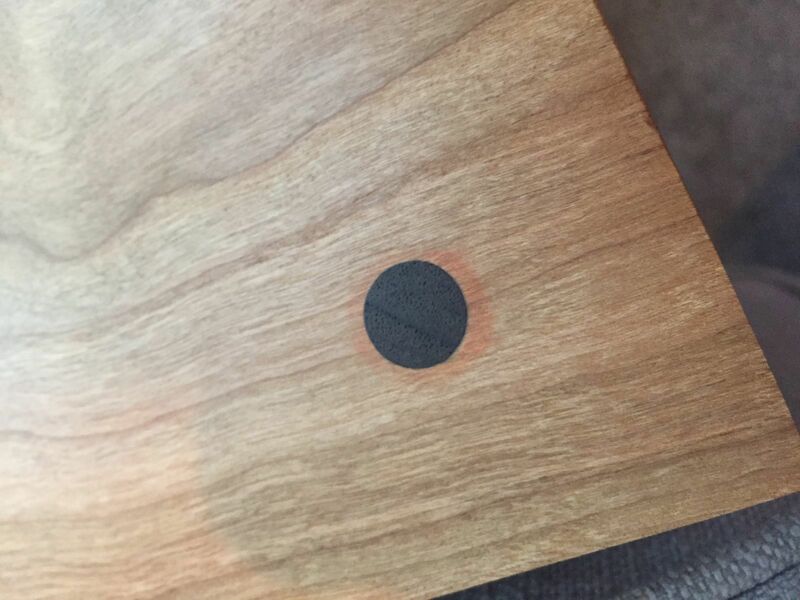 Now that the project has been finished with Arm-R-Seal, would it work to sand off the finish to remove the glue marks and then re-finish it? In the end, I’d like to make this project look great again. Any thoughts would be most helpful. Thanks for your time. When sharpening chisels, do you put a micro bevel on them or just a standard 25 degree?